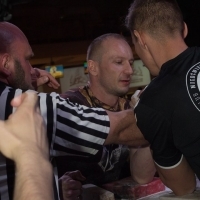 Dariusz Muszczak is an experienced competitor of the Polish armwrestling scene, from year to year upgrading his sports skills Today Dariusz is a leading competitor of the MCKIS Tytan Jaworzno club and the Polish National Team. He is the owner of several national (including the Polish Champion, the winner of the Polish Cup) and international titles (the winner of the second place for the left hand of the 95kg class of the Professionals' World Cup 2009). In November 2009, while competing in the X Polish Cup in Starogard Gdanski Dariusz defeated many successful competitors from the Polish armwrestling scene and won the title Strongest Pole for the left hand in 2009. Dariusz's training is quite specific. A very strong emphasis is placed on work at the table. To improve the weak points and work out the best movement of the arm in the given fight technique Daris mainly chooses weaker sparring partners. In the period beyond start-up time, Dariusz trains more developmental training (let's call it body-building). Only three months before the competition he introduces a typical strength training for armwrestling. A month before the event he focuses more on the training at the table. Dariusz in his strength trainings primarily trains at high loads with little repetition. He does almost all the strength exercises once a week. The greatest sports successes: silver medallist at the Professionals' World Cup 2009 of the left hand, multiple medallist of the Polish Championships, the Polish Cup, The Strongest Pole of the left hand in 2009. Dream: to start a family and of course, be the strongest in armwrestling in his class in the world. Before Dariusz starts his strength training he always warms up his whole body for about 15 minutes performing the developmental exercises. They are mainly stretching exercises. Only when he feels he is maximally warmed up he starts a right training. It is worth to add that Dariusz then performs the exercises in the full range of motion of the arms. In this exercise, Dariusz primarily focuses on the accuracy of performed repetitions. He is trying to dynamically raise up a thick bar and slowly lower it down. Dariusz often stops his hand for a moment in the middle of the movement doing retention. Dariusz performs this exercise once a week in 5-6 series of 15-4 repetitions. With the increase of the load the number of repetitions decreases. The elbow is based on a half of the table. An adjustable block ended with a thick grip handle is set in the middle position of the lift. In this exercise, as in the previous one, Dariusz is trying to focuses more on the accuracy of the movement. In the last series (with a high load), Dariusz often tries to do to the retention at 45 º.
Dariusz performs this exercise once a week in 4-5 series of 8-6 repetitions. With the increase of the load the number of repetitions decreases. For this exercise, Dariusz uses dumb-bells with a thick handle. The forearm is based on the innert part of the thigh. The wrist is slightly moved beside the knee. The movement begins from the upright position of the wrist, and ends at the moment of the maximum closure of the inside of the wrist. In this exercise, one of the most important elements is the little finger, which is needed in the technique of the hook. It is what Dariusz mostly concentrates on. The elbow is based on a half of the table. An adjustable block is in the upper position of the lift. Dariusz performs this exercise in accordance with the opinion "accuracy above all!". He is tries to repeat the exercise slowly and to control the weight completely. For this exercise, he is uses a specialized hand on the belts. Dariusz in this exercise strengthens the wrist and fingers. He tries to perform this exercise with big weights. Dariusz performs this exercise once a week in 5-6 series of 15-4 repetitions. With the increase of the load the number of repetitions decreases. In last series Dariusz does the only the retention at maximum load. The elbow is based on a half of the table. An adjustable block is closer to the middle position of the lift. This is the only strength exercise which Dariusz performs more than once a week. Dariusz performs this exercise in the 5-6 series of 8-4 repetitions. The elbow is based on a half of the table. An adjustable block is in the upper position of the lift. Dariusz just as most of the armwrestlers uses a judo belt for this exercise. He tries to perform a turn of the wrist as deep as it is possible. Dariusz performs this exercise once a week in the 5-6 series of 8-4 repetitions. Training on bars avails an armwrestler at different phases of preparation period. Dariusz to improve the speed and increase the endurance focuses more attention on these workouts during the preparatory period before the competition. In the final phase of the preparatory training on the rubbers he performs this exercise more than once a week. The thickness of rubber depends on his training abilities. Dariusz performs this exercise in 3-4 series of about 20 - 8 repetitions. In each subsequent series he moves away so that the level of difficulty was even greater. This type of training is a perfect imitation of wrestling in a hook technique. Training on a rubber perfectly increases speed and precision of the movement. Dariusz recommends it especially in case of muscle attachment ache. Dariusz performs this exercise in 3-4 series of 20-8 repetitions. In each subsequent series he moves away so that the level of difficulty was even greater. In this exercise, Dariusz wrestles not only with his opponent's arm, but also with a rubber. When banging your opponent to the side pad, rubber additionally increases the tension and hampers the practitioner to end up the movement. Dariusz performs this exercise quite slowly, each time with a constant tension of the hand. In each subsequent series he moves the table away so that the level of difficulty was even greater. Each series is performs in a few repetitions until the arm gets tired.